The concept of living in flats/apartments has become the necessity of modern metro life. It is a misconception that a vastu compliant house needs to be built on one acre plot. In fact, the very basic concepts of vastu can very much be applied in flats/apartments- however, it requires good understanding of vastu shastra. 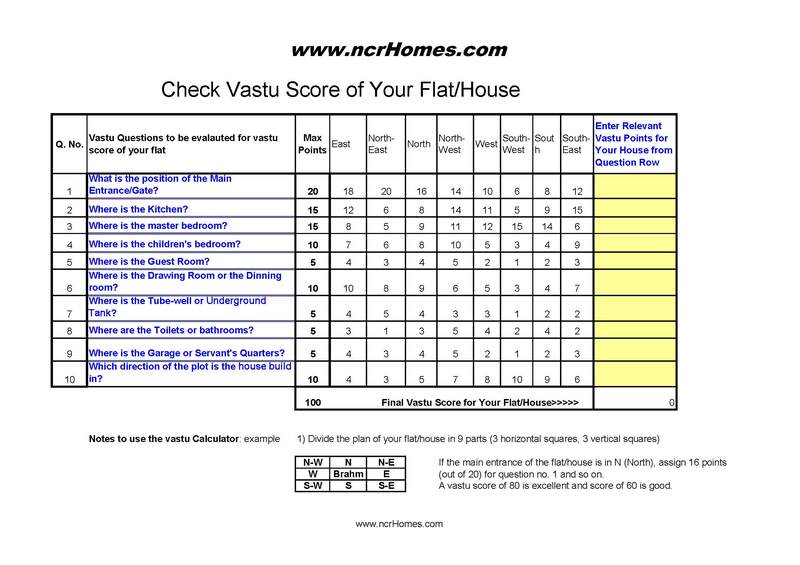 Keeping in view a large population who do not have time or money to consult a professional vastu expert, we are giving here free useful tips along with a vastu calculator that can calculate vastu score of your flat or house. Vastu could help to make one’s living comfortable in flats and prevent illness and other dangers from creeping into life or relationships. Go through them and know the right Vasthu for flats, to make your life happy and prosperous. Good Directions: south-east, north-west, east of house. Face east while cooking, water tap to be in north-east and daily waste to be in south-west corner of kitchen. Good Directions: southwest corner (best), south and west. The occupant to sleep with head pointing towards south. The head in the north direction should be avoided, to prevent nightmares and disturbed sleep. The bedroom mirror on the wall opposite your bed to be avoided as it disturbs sleep. Do not place aquarium or puja place in the bedroom. Good Directions: north-east, east, north. Locating ‘Pooja room’ in north-east brings prosperity, good health, wealth, happiness and peace of mind since morning sunrays fall directly from north-east and give us positive energy. Puja room should not be in bedroom or next/adjacent to bathrooms and kitchen. We should face East while worshipping. Good Directions: north-east, north-west, west, east corners. Best combination is study room and puja room to be adjacent. Good Directions: East and northern side for entry of positive energy. Try to close the balconies in south and west side to avoid entry of negative energy. Good Directions: West-side wall, box facing east. Alternatively, south-side wall, box facing north. It should be preferably open to the north, which is the direction of Kuber, the God of wealth.